Sometimes it pays to keep things simple: Deliver a good picture, good sound, and a clean interface. That’s the formula Samsung follows with the UN55JU6500, a 60Hz, 54.6-inch TV that does just about everything well. You don’t get a lot of bells and whistles with an online price of $1000 (down from an MSRP of $1700), but the basics are exceedingly well done. It’s not quite budget Ultra HD nirvana, however; while the UN55JU6500 largely does a very good job with motion compensation, it has only a 60Hz refresh rate, and that comes into play during action shots and when playing 25fps content from local media—even if only slightly. For the price, you’re not going to find a TV with richer colors, though the UN55JU6500’s green is heavily skewed towards yellow. Too often it’s lime rather than verdant. That might reflect a bit of observer syndrome as I spent an evening viewing Samsung’s more expensive quantum-dot SUHD models only a day after this TV arrived. Okay, the spectrometer backed me up; still, you can’t unsee a superior TV once you’ve seen it. Anyway, screen uniformity was nearly flawless; i.e., there were no overly light or dark areas when a light background was displayed. 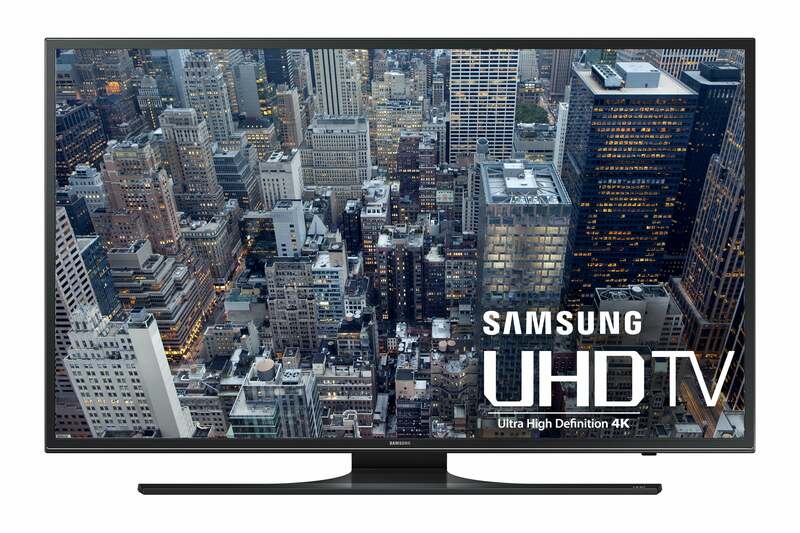 Samsung’s 54.6-inch 55JU6500 Ultra HD smart TV is a bargain. When Ultra HD content was decoded before it reached the TV (with an Amazon FireTV, Roku 4, or a PC, for example) the UN55JU6500 had no issues. Only the slightest of motion artifacts were observable, and I had to look hard for those. But playing media files from a USB drive (there’s one USB 3.0 port and two USB 2.0 ports) using the onboard decoding and processing delivered results that weren't nearly as good. There's nothing fancy about Samsung's remote, but gets the job done. Our 60/30fps UHD test videos played very well, revealing under scrutiny only very minor motion artifacts that you probably wouldn’t notice in everyday usage. But with our 25fps files, motion compensation wasn’t nearly as smooth. Judder was slight, but noticeable when using the Standard motion compensation setting. It became jarring when I tried to make it go away using the Smooth setting. Solution? Record your home movies at 30fps if you can; dividing 60 by 25 can be tough for some TVs. For a thin TV, the UN55JU6500 sounds quite good. And unlike the other TVs in this roundup, you can pair this one with Bluetooth speakers or headphones (keyboards and mice are also supported). It also supports an amazing number of audio file types, including FLAC and Apple lossless (for classical music types). Someone in audio at Samsung is on their toes. The Samsung’s remote is decently easy to use, with well-organized buttons for an old-school design. But it can’t help but suffer in comparison to LG’s Magic remote, as well as the Panasonic and Sony touchpad remotes. Regardless, this is a far less-expensive TV, and the interface is well thought out and easy to get around. It's ot quite as easy to use as the LG’s WebOS or Panasonic’s Firefox OS, but it’s close. The Samsung UN55JU6500 is a steal, being priced several hundred dollars less than its nearest competitor in this roundup (although you’ll likely see heavier discounts on those pricier models). Yes, it’s refresh rate is only 60Hz, but that will affect relatively few users and the picture and motion are quite good by most standards. It’s also easy to use, sounds very good, and supports a large array of audio files. My suggestion: Just think of its slightly lime-ish greens as tropical friendliness. 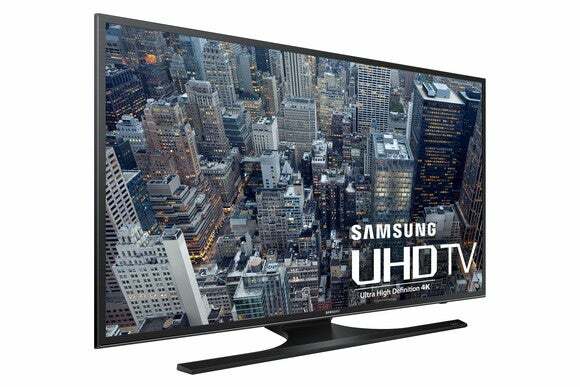 An affordable 54.6-inch TV that does everything well. Good picture, good sound, good file decoding. 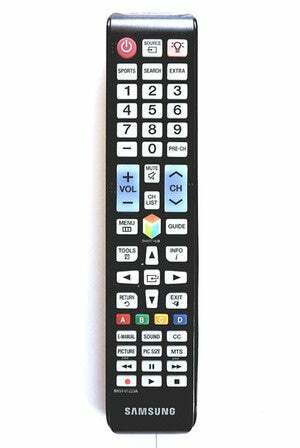 The remote is old-school, but the onscreen user interface is clean and easy to navigate.